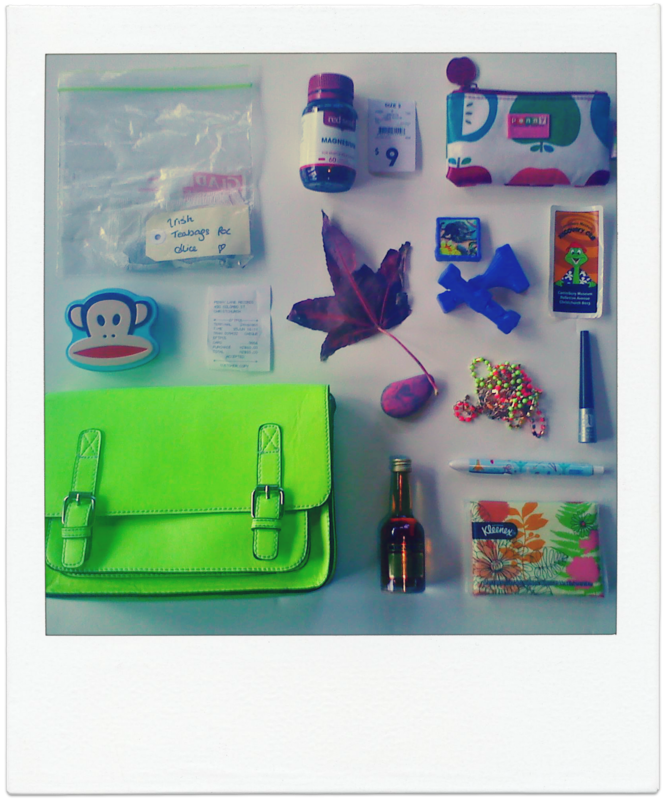 Honest to Blog: What’s in my handbag. From Top Left – Bottom Right. Child Occupier: tin containing paper and pencils. Receipt for $60 worth of records (that should have been spent on paying the Rates). Mama! Please Hold This: leaf. Mama! Please Hold This: miscellaneous plastic tat. Mama! Please Hold This: sticker from the Canterbury Museum. Mama! I Made You This: painted rock. By all means, marry. If you get a good wife, you’ll become happy; if you get a bad one, you’ll become a philosopher. – Socrates. Theo: Why do wives go to the roof? Theo: Wives. Why do they go in the roof? Alice: …Do you mean wires? Theo: Yeah. Wives. Sometimes when you have wives you don’t have any energy. Mabel: No! You take it easy! Theo: You take it easy! Mabel: YOU TAKE IT EASY! Theo: YOU! TAKE IT EASY! Mabel: YOU! TAKE! IT! EASY! Theo: …Wanna go play something else? Mabel: …I don’t have armpits. Mabel: Yeah, dunno. I’ve just got this fanny in the back, and this fanny in the front. Alice: Okay baby. So, you’ve got no bottom? Mabel: Nah and I’ve got no armpits today. She’s a big fan of my work. Mabel: Mama! Your leg is prickly! …I love it!